Fig. 11.5-2. Transverse section of foxglove stem (Digitalis). Most species of dicots have a ring of vascular bundles, but a few like this foxglove have a more or less continuous ring of vascular tissue. The tissues are still in the typical arrangement (with protoxylem innermost, then metaxylem, metaphloem, a tiny bit of collapsed [and not visible] protophloem). 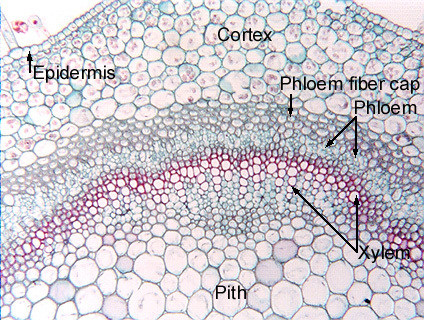 The cap of primary phloem fibers is also a continuous ring.